THIS TRICK ALWAYS SOLD OUT AT EVERY LECTURE IT WAS SHOWN AT. VERY POPULAR EFFECT WITH BOTH MAGICIANS AND MENTALISTS. Available again by popular demand, long off the market for over three years. Now made in up-to-date topical frame puzzles, with characters from Frozen, Spiderman, Teenage Mutant Turtles and many more. 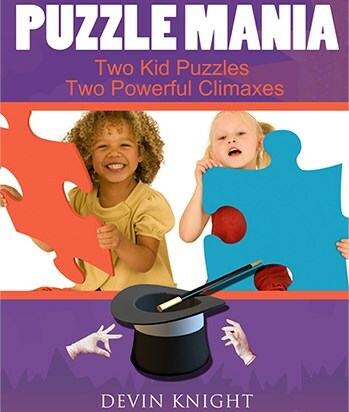 Puzzle Mania is a new twist on the standard jigsaw puzzle effect. This version has been designed especially for kid shows. Yes, it is mind reading for kids and has been a proven winner in hundreds of kid shows. Every phase is logical and makes perfect sense. This is not the standard jigsaw puzzle effect, but one that has a new twist to the plot, and two climaxes. That is right; you do the effect twice, two different ways, and make the child the star of the show at the end! Here are the effects: The performer shows two duplicate tray puzzles. One is left completely assembled. All the pieces from the duplicate puzzle are shown to be inside a clear bag. The performer says he will play a guessing game with the kid. He tells the kid to reach into the bag, remove a puzzle piece and hide it behind his back. The performer does not watch while this kid is doing this! Once the kid has done so, he tells the performer. The performer puts the bag on the table so all the faces of the puzzle pieces are hidden, saying he does not want anyone to think he can see what piece is missing. The performer says he will try to guess what piece the kid has hidden behind his back. The performer picks up the fully assembled puzzle and looks it over. He removes a piece from the puzzle and puts it on the table. He says he thinks this is the piece that the kid has behind his back. He asks the kid to bring the piece behind his back forward and see if it fits into the puzzle. It does! The puzzle is complete again. The performer has correctly guessed the piece the kid removed. This is the first climax and even blows away adults watching. The performer then asks the kid if he thinks he can do the same thing. If he can, he will win a prize. The performer then turns the completed puzzle around and secretly removes one piece from the puzzle; while the kid has his back turned. He props the puzzle up on the table so only the back of the puzzle board shows. This way no one will know what piece is missing. The performer drops the piece he removed into the clear bag with the other pieces and mixes all the pieces up. He tells the kid that he has one chance to win. All he has to do is reach into the bag and remove one puzzle piece. If he removes the piece the performer removed from the other puzzle, then he wins a prize. The kid reaches into the bag and removes one piece. The performer turns around the puzzle showing one piece is missing. The piece the kid removed fits perfectly and he wins a prize. The prize can be a candy bar, small toy or magic kit. This is a very baffling ending and when the child finds the piece you removed, it makes him the star of the show. The perfect effect for the birthday child. This routine has been tested in hundreds of kid shows and leaves the parents shaking their heads in disbelief. Such a thing does not seem possible! There are no sleights and the puzzle pieces are not switched. Trick comes with two frame tray puzzles. One is left assembled and the other matching puzzle is for the pieces that go into the clear bag for the child to choose from. The trick now comes with a folding plastic stand to display the puzzle on for easy viewing of the audience. NOT JUST FOR KID SHOWS: You can use this even in adult mentalism shows and explain that you first developed your mental powers while a young child doing this psychic game with your friends using a child's frame jigsaw puzzle, then proceed to demonstrate with an adult from the audience. This plays great and I have used it in over 100 adult mentalism shows! There are 20 different puzzles available, that means if another party magician in your area buys this trick, you both should have different puzzles. The kids won't recognize your puzzle; like they do coloring books and yell, "I've seen it before." This is a great feature of this trick. These puzzles appeal to children of all ages.